Buy Set Wet Restyling Wet & Wavy, Spikes & Straights Hair Gel India - Paraspharma Products. Style you Hair, it keeps it stylish for longer. Tired of the way your hair doesn’t respond the way you want it to? 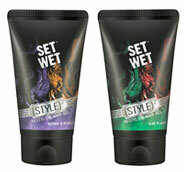 Use Set Wet’s new Spikes & Straights Hair Gel to keep it in style. To change the way you look simply apply water and re-shape your hair to suit your mood. It’ll keep the ladies guessing what’s going on in there. Let your moods rule your hairstyle with the, new Spikes & Straights Restyling Hair Gel from Set Wet. Apply once and let your hair come alive in style. To result just use a little water and see women go crazy over your sharply changing hairstyle. Never lose that ‘spanking clean’ look with Wet & Wavy, the new hair gel from Set Wet. Apply to wet hair and style any way you choose. You’ll see your hair responding in ways you never thought, and the ladies, in ways you never imagined. To restyle, apply a little water on hair and style again.